Happy Saturday! Today is my first new post since I've gotten home from the hospital and I'm really glad to say that I'm starting to feel leaps and bounds better than my first day after surgery. My pain is minimal and I'm sleeping through the night, plus most of my nausea is completely gone! Woo hoo! This post features two of my favorite things: holographic polishes and nail vinyls. 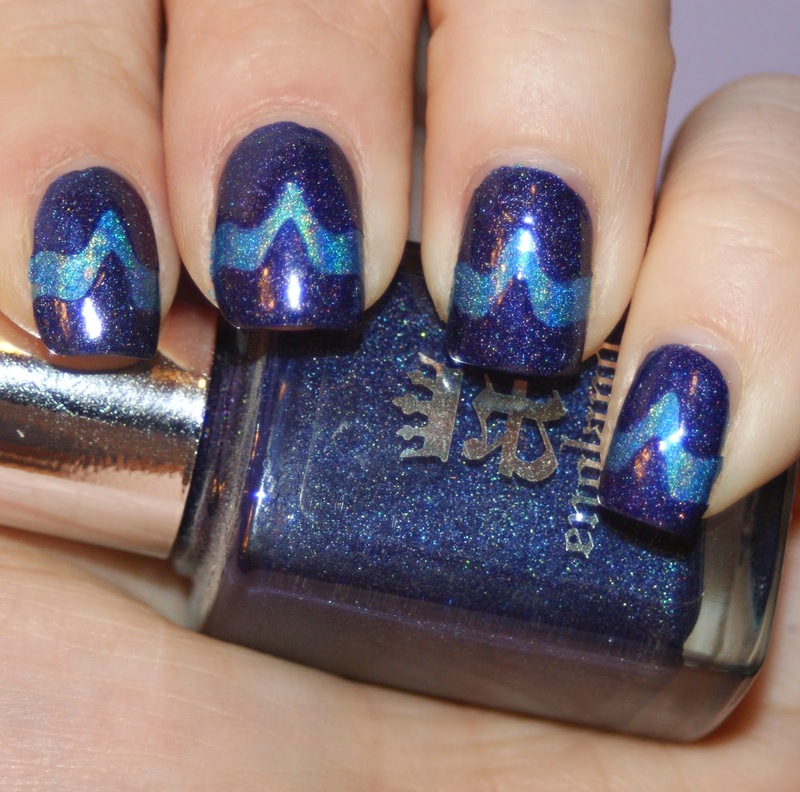 The nail vinyls used to make this manicure were fancy chevrons from Up Your Nail. Up Your Nail is pretty much my go-to store for the vinyls because their prices are ridiculously awesome. These chevrons came in my mystery bag but are 100 vinyls for $2.50. I haven't seen anyone else's prices come remotely close to that! To achieve this look, I used three coats of Layla Ocean Rush as my base with one coat of a-England Tristam on top. I like the look of the scattered holo on top of the linear holo, though I'm interested to see how this would have turned out with two linears. What's your verdict on this color combo and pattern? Have you tried Up Your Nail? I've never tried nail vinyls before, but this mani looks awesome! I'll have to check out that shop. I love the base color. i wish it was sunny enough for me to fully enjoy my laylas.